I was at the Ajanta Theatre gig on the 19th April 1980. I went with my brother, Darrell, who I believe may still have a promotional poster from the event. I long ago lost the multiple copies of Komakino that I'd got from R.E.Cords on Sadler Gate in the weeks before this gig. Just one problem though. 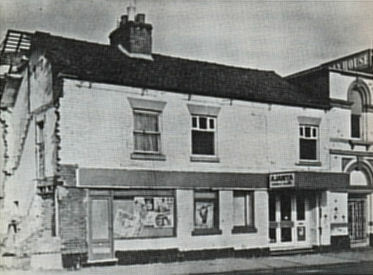 The picture of a building with the word "Ajanta" on the side http://members.aol.com/lwtua/c190480.htm looks nothing like the Ajanta Theatre which used to stand on Sacheveral Street in Derby. It could be my failing memory, but that's just not how I remember it looking and it was a regular haunt for me, I saw a loads of bands there, the UK Subs and Magazine being the most memorable, the former because of all the fighting and the latter because there were 13 people in the audience including myself, my brother and a dog. It may just be the angle that the picture is taken as I usually approached the building from the other direction (coming from town via The Spot). It is worrying me though. Can anyone definitely confirm that this picture is or is not the Ajanta Theatre on Sacheveral Street? I wonder if this gig was as electric as it sounds on Le Terme bootleg? The band sounded at their very best, Ian's voice sends shivers down your spine and the crowd reaction between songs was great too. Very few people talk about this gig as their one of their favorite bootlegs, but honestly the performance is really good as is the sound quality on the bootleg I have. With all of the off performances, canceled gigs and craziness in the final months of the band, they sounded near the top of their game during April 1980. Hard to believe this was the second to last gig they would ever play. As for Le Terme, despite all nagging about poor sound quality, it indeed sounds amazingly electrified. I also appreciate that exciting depth in the sound, which probably is due to that furious compact wall-of-sound. So, when I bought A Journey That Leads To The Sun, with its technical so superior sound quality, I couldnt help missing some of those things from Le Terme . But has now sussesfully come to terms with even that. The perfomance of that night has all one could ever wish for, IMO. Outstanding versions of merely all songs, Insight, Isolation, These Days, SLC etc...It might not have sounded as extremely electrified as Le Terme suggests, probably more like A Journey That Leads To The Sun, which is more than enough. Thanks for your replies which I am delighted with - my opinion of Le Terme compared to A Journey That Leads to The Sun are exactly the same as Mikael's, he could not have summed things up better. It's great that we are lucky enough to be able to compare two different recordings of this gig. Ok, just looked up the bootleg guide to refresh my memory on the boots of this show! The Ajanta Theatre gig on the 19th April 1980 is one of better recorded gigs; that is for sure. I think "A Journey That Leads To The Sun" is the best document of this gig, and is a solid 8+ on the sound quality.......what a great gig. Just short of getting a copy of the master tape and having that remastered, which I assume no-one has, I think a "A Journey That Leads To The Sun" is the best example! DM Don't forget ya friends! Not sure I understand what your saying? Did you need a copy of "A Journey That Leads To The Sun"? As far as I'm aware "A journey that leads to the sun" is the best available version of this show. The old LP'S are terrible, and the "Beginning of the end" is not bad for vinyl. I'm sure you can pick one up on ebay. Although I prefer the more atmospheric tracks on le Terme to Journey That Leads To The Sun, the latter has the added advantage that the soundcheck tracks from High Wycombe have a lot more 'between song' recording than is featured on the Still disc 2. It adds to it considerably in my opinion, too. I still haven't heard anything from "Le Terme". Is the sound quality better then what is found on "A Journey That Leads To The Sun"? I bought the original 'Le Terme' LP many years ago ...and its much worse quality (very muddy) than what can be found on "A journey that leads to the sun". I'd personally stay well clear of Le Terme ...given what is now available. If you see a few earlier posts on this thread, Darkman, Le Terme's sound quality certainly isn't as clear, it is a different audience recording, but it is extremely memorable - I prefer it, the atmosphere sounds absolutely electric, but really it's down to personal taste and what you are looking for - if you like a nice clear sound, I have to admit AJTLTTS is definitely the one. I had a paralell listen to them both yesterday, switching from one to the other, and what stroke me most was the significant change in treble. Going from AJTLTTS to Le Terme was a bit like pulling the curtains from a window. Most noticeable in guitar and hi-hat/cymbals, I would say, which on Le Terme is so much richer and really up close in the sound, almost to the level of white noise sometimes. I guess it effects vocal and synth too, if not that clearly, and maybe does none with the bass. On the whole I think it has a great deal in creating this more electrified, furious and intense sound on Le Terme. Describing it as terrible or really muddy is imo completely misguiding. The impression I get, when switching back to AJTLTTS, is a better seperated sound, more powerful, but at the same time more encaged as a whole, without that sparkling organic life of Le Terme. If I never heard the latter I might have been completely happy with AJTLTTS, now I cant help feeling a bit ambivalent. The full gig in precise Le Terme sound quality would be great. Again I agree with your analysis of the difference, Mikael. The Ajanta Theatre reseeded on Dime on 02 June 2009 appears to be the from the same audience recording as Le Terme and does have the full gig, except the Colony encore. However, unfortunately it suffers from what the uploader calls "some wow and flutter across it" which does rather impair the enjoyment, but it's well worth a listen. I agree that the full gig in Le Terme sound quality would be really special. I think "Le Terme' will be one of the next vinyl transfers I do on my blog. I will start looking for a mint copy in the coming weeks! Might take a little while, but I promise the transfer will be as good as it gets. The audio will sound as good or better then the vinyl! I will let you fine people know when I post it! rather disturbed version of one of the two known existing ones. I guess the latter are the most likely. Darkman, if you now will invest in a mint copy of Le Terme, just keep in mind that you might find mine and bigals opinions a bit too subjective, since some others clearly dismiss it as crap. I never seen any positive respons to this record on this forum ever, so bigals opinions were indeed very welcomed. My copy of Le Terme was a cassette tape I got in the mid 80's. I was chuffed to bits to finally find it hosted on a Blog a few months back so i could finally get it on my pc and mp3 player. If you get hold of a mint copy and put it on your blog, Darkman, that would be absolutely superb, would very much look forward to hearing that as it would be even better than what I currently can listen to. Likewise Mikael - I too was delighted to finally find someone who is on the same wavelength as me about my favourite ever gig recording. I won't ever understand how many other lovers of JD appear to regard it as an inferior recording but there you go, each to their own.